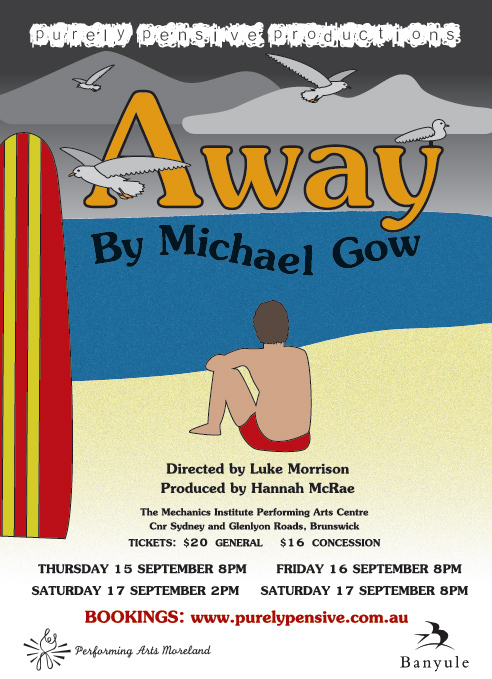 Away was presented by Purely Pensive Productions on September 15, 16, 17 2011 at the Mechanics Institute Performing Arts Centre, Brunswick. Away tells the story of three separate families holidaying on the Australian coast for Christmas in 1968, who are thrown together due to a storm. Each of the three families hope that their holiday will resolve their family crises, including parents grieving the loss of their son in the Vietnam war, a young man who is dying from leukaemia, and a challenging teenage relationship.